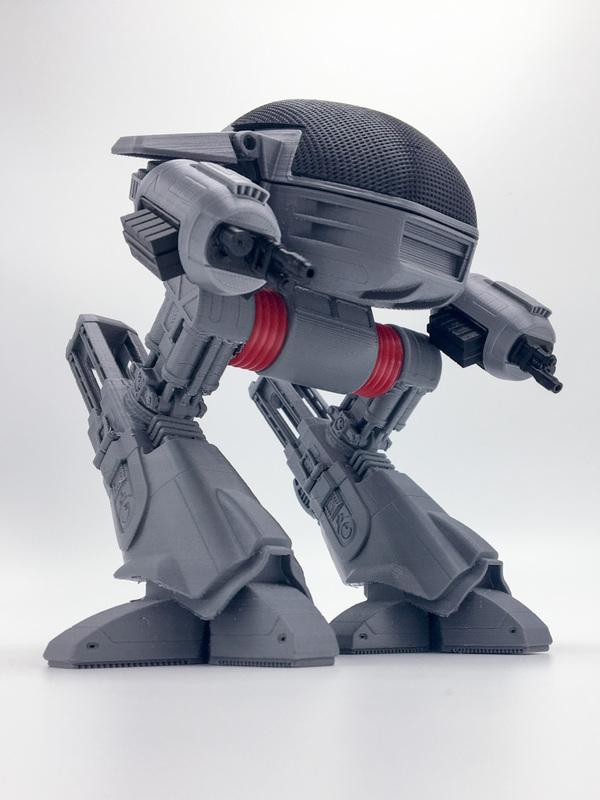 3D Print this epic ED209 from the movie Robocop. 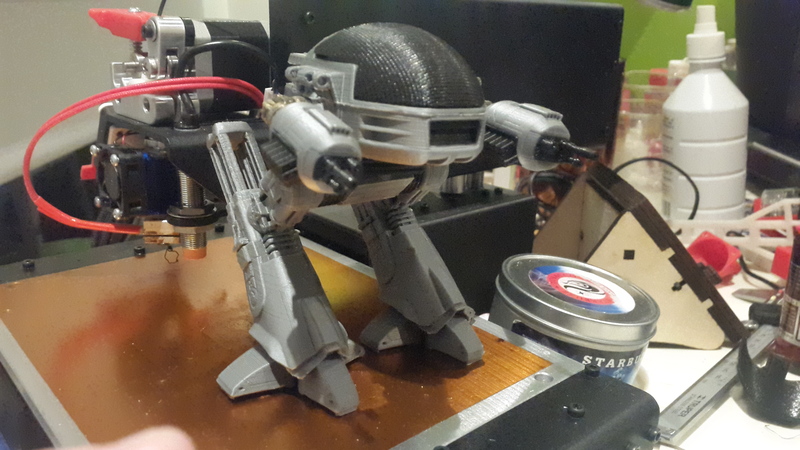 You have 5 seconds to comply! 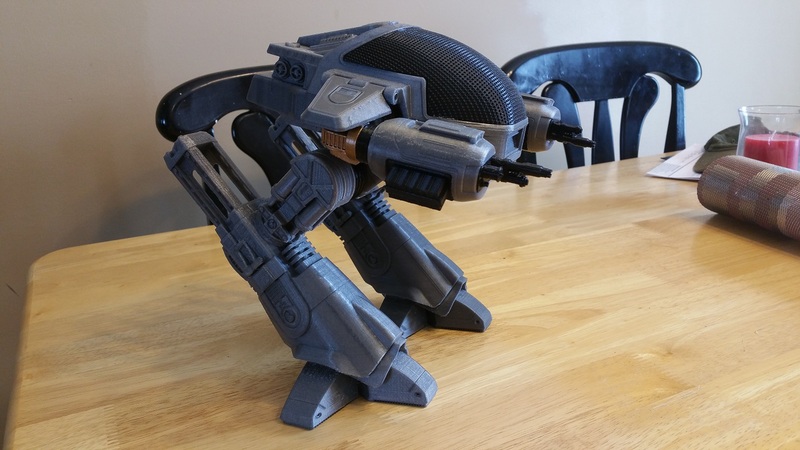 3D Print this epic ED209 from the movie Robocop. 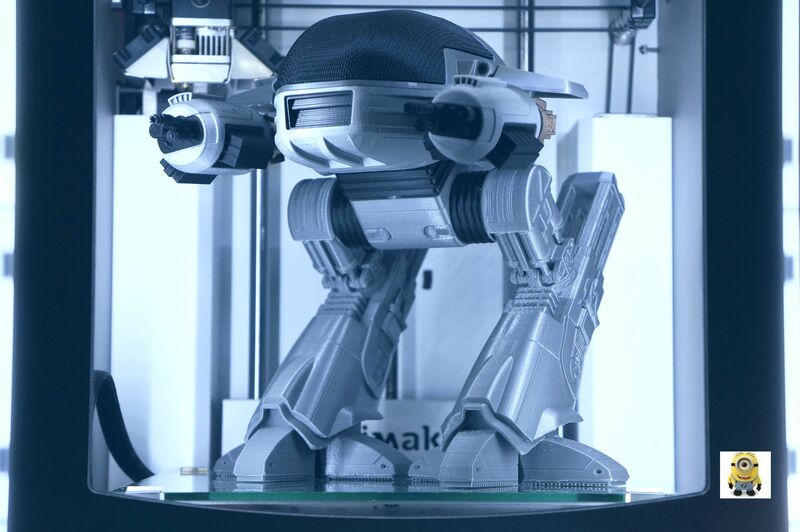 The model is a remix of a 3d model by Onur AYTEKIN and was remodelled and resized to be printed on the Ultimaker 2. There were alot of testing and printing of parts to get the look right, especially around Ed's Black Visor. Several iterations were done with different patterns. 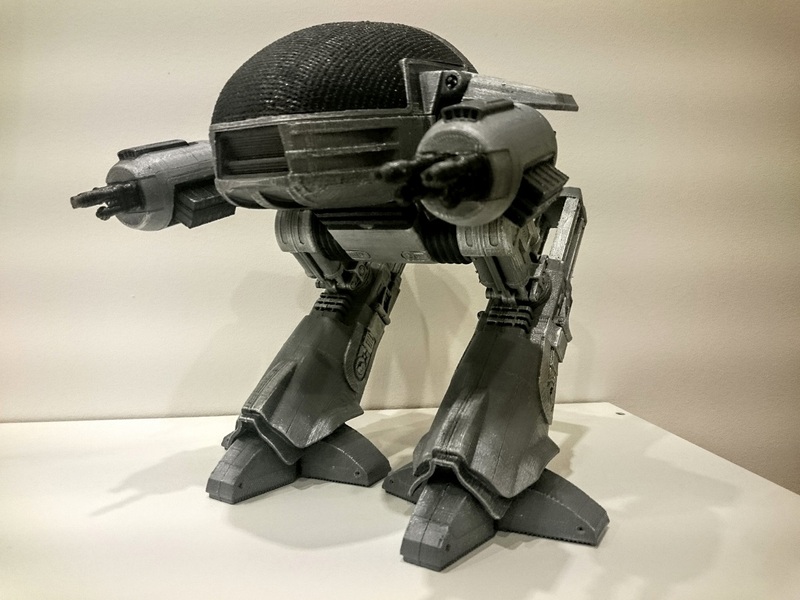 This 3D print model is made from 23 parts. The legs require "fix horrible" Type A and requires supports "everywhere"
The images you see have very little post-production or painting and is taken straight from the printer, minus a little bit of sanding and polishing of the Bronzefill printed parts. Printed at 85% scale, with tweaks mentioned by others. i found the ED_Arm_Blackflex_x_2 at 105% and ED_Rubber_Torso_Blackflex at 80% but everything else came out really good, thanks for the design. - The black torso have to be scaled to 80% and then a part has to be cut. - Arms black rings have to be printed a 105% so they can fit in. - I had to remove some little details in the cockpit so the visor can fit perfectly. But all in all, this design is awesome! Hey! How did you print the visor? Like 1) or 2) http://imgur.com/a/sDBN2 ? Awesome model otherwise! Appears to be that the right leg without supports is missing. Don't want to assume that a mirror of the left will suffice. Great model. Reduced to 75% to fit printer. @bnagel well there are the non meshmixer files you can use to generate your own supports. If you do create your own supports that works better, it would be nice if you can kindly share with the community. All the meshmixer supported files are a bit of a nightmare. Supports are merged with the model and some don't provide the correct supports. Good looking. I did some attitude adjustment remodeling. Scaled down 50%. Details are still great. The "guides" on the upper head part need to be trimmed/beveled so the visor/canopy can sit perfectly. Really cool once assembled! 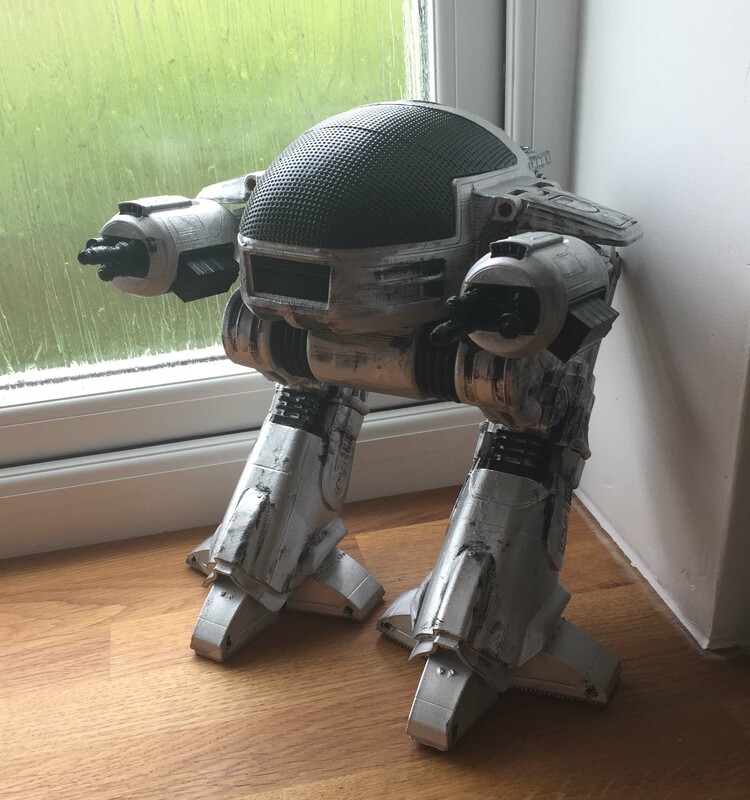 I finally finished my Ed-209!!! 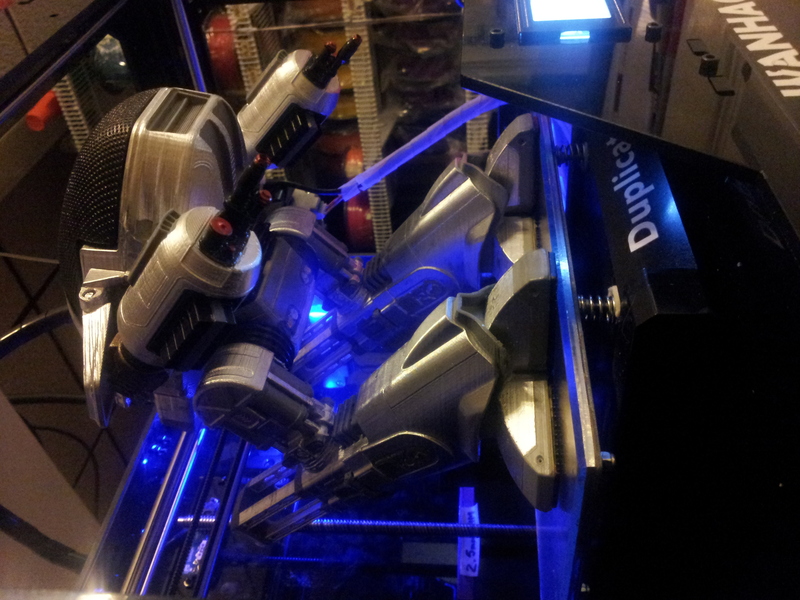 Looks amazing, it took me about a week to print everything, the right leg held me back a couple of months! I kept having issues with support but yesterday I finally got it. 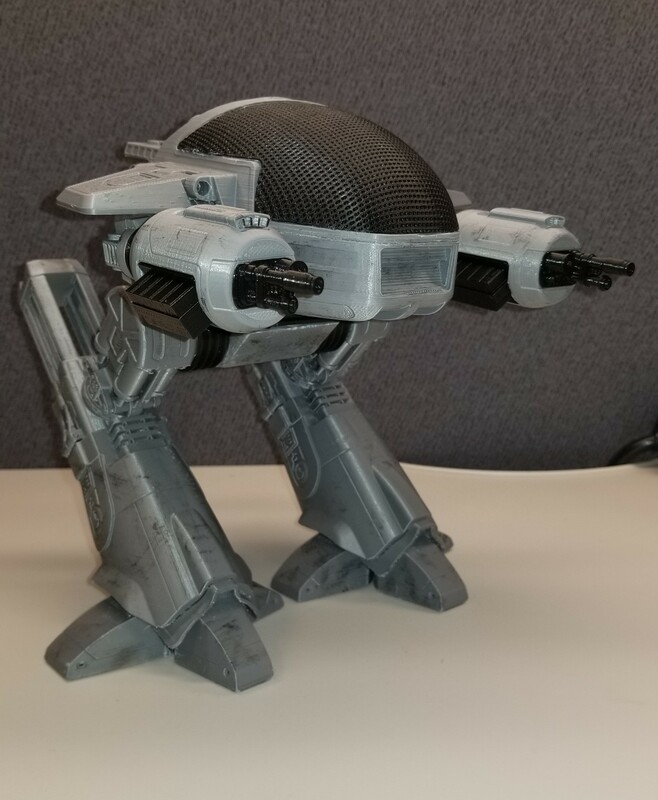 Also the fact that each leg takes about 14 hours to print held me back. It is hard to find that kind of time around here! Thank you so much for sharing this model! On a side note, maybe if you slice the legs up into multiple pieces then we could print them with zero support! I would do it if I had the software and the know how. Reduced to 85%. Stuffed 16 parts on to 1 platter,, that was fun. Had to manually add supports,, to the Leg supports ?? Piece of filament,, on fire,, on both ends,, stick to support and bed at same time,, = Instant cross-brace. The canopy latching frame-bar needed to be chamfered back to 45*, in-order to receive the canopy. Printed the canopy without raft or supports :) Painting turned out pretty good. After reading a recent article on finishing techniques,, I'll know next time how to finish it pro-style. ED209 - "online & activated"